Uniformed light artillery soldier, with the soldier depicted, most likely Joeckel himself. The soldier's facial image is applied and painted from a photograph, and then merged by a skilled hand. 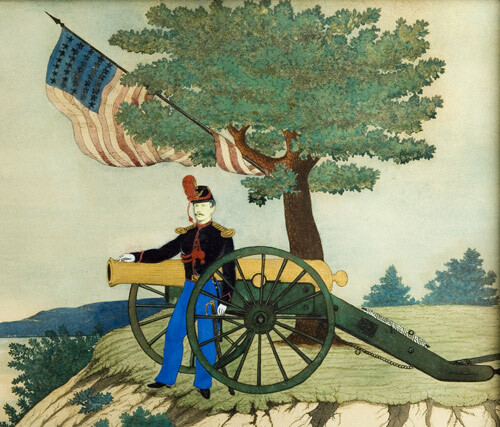 Soldier is wearing a shako and posed at cannon beneath tree flying American flag atop grass covered bluff overlooking harbor. 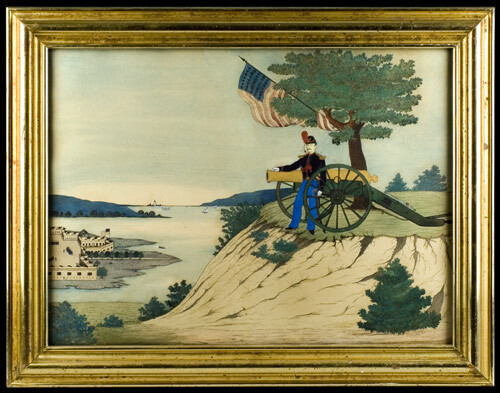 Fort flies American colors; and in the distance is seen a side-wheeler flying the American flag; a lighthouse and mountains complete this waterscape/landscape. 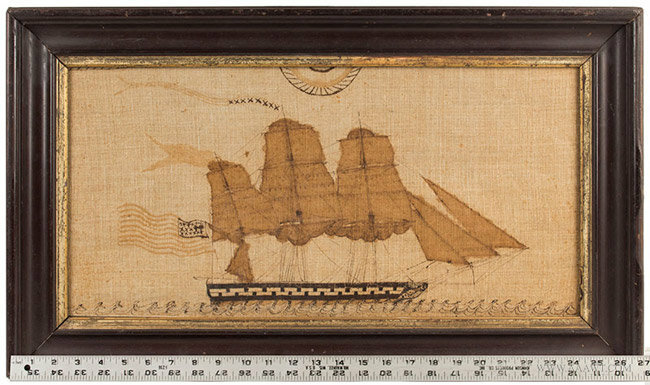 The work which retains strong and bright pigment is mounted within a period gilt frame that measures 29.25 by 22.75"; view area: 24.25 by 17.75". Charles Joeckel was a 34-year-old who enlisted in Boston, Massachusetts on 12/31/1864 into the U.S. Army Batty K, 3rd Light Artillery as a Private. He mustered out as a Sergeant on 12/31/1867, also in Boston. Joeckel enlisted near the end of the war and was a bit long-of-tooth at 34 years old. 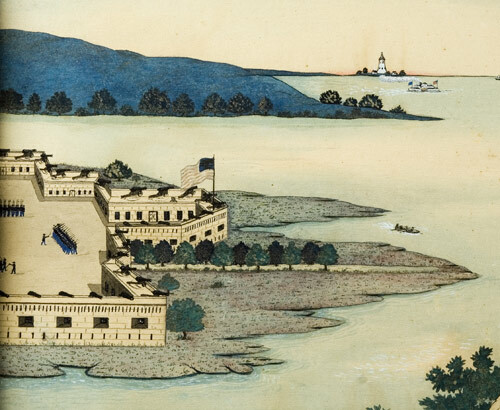 With Ft Warren being in Boston Harbor, and Ft Independence being in South Boston, one of these forts is likely be the subject of this watercolor. Fort has also been tentatively identified as West Point. 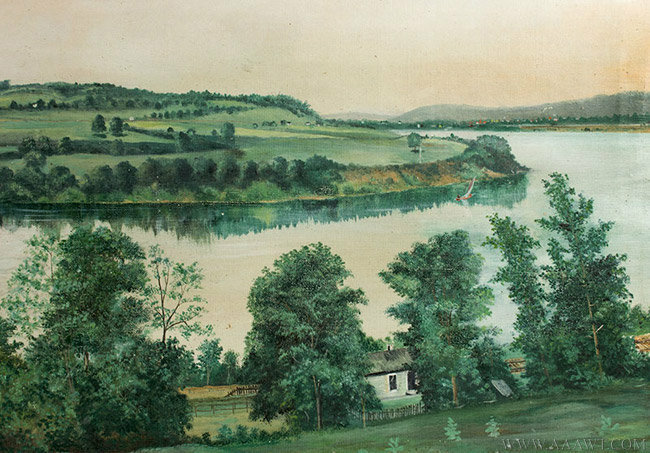 Someone who has studied the fort architecture contemporary to the execution of the watercolor may be able to provide and absolute location. 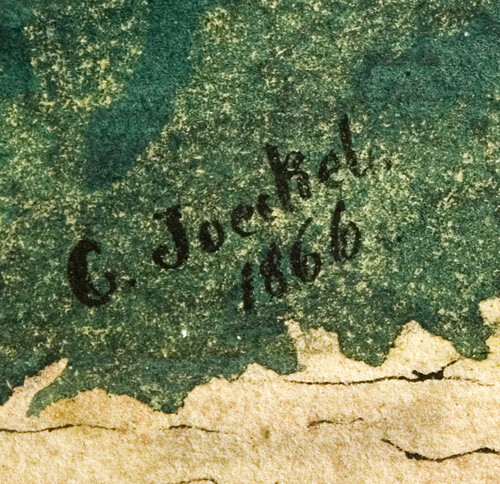 Joeckel is assigned to the Regular Army rather than a specific state, which would help explain why he did not muster out at the end of the war as did most soldiers, but instead remained for his full 3-year enlistment. His home is credited as Sandisfield, Massachusetts. 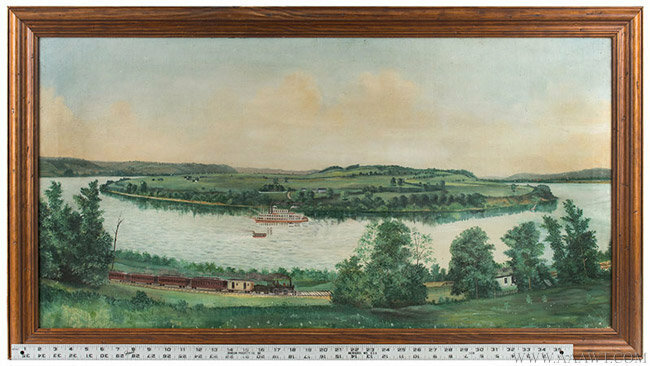 Original condition, Frame: 15 by 28.25"; view: 9 by 22.25". 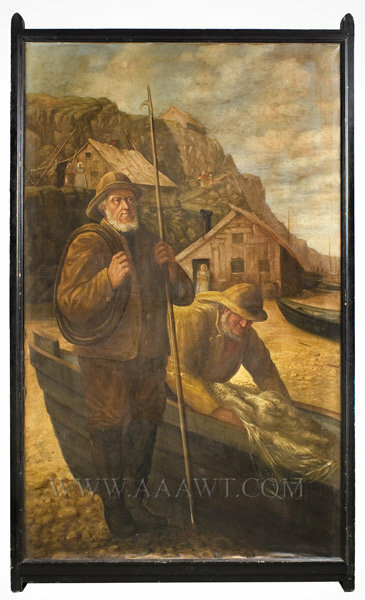 It has been suggested that this picture compares to others of the Newlyn School. Women in doorways watch as their men folk in foul-weather clothing prepare for another journey in the pursuit of mackerel (Newlyn's main industry). The artist was born in Petrograd, Russia and studied art at the Royal Academy in Petrograd. 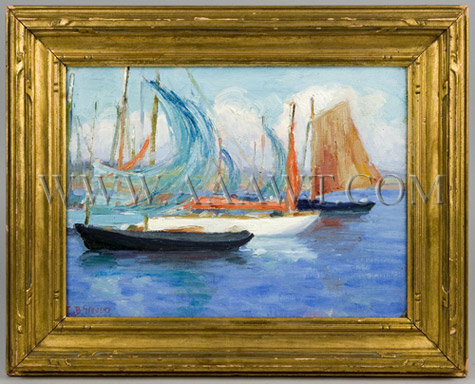 After painting and teaching for a short while within the Soviet Republic, Simkhovitch immigrated to the United States (1924) to settle in New York; later in Greenwich, Connecticut. Soon his work was included in major international exhibitions. Simkhovitch was a frequent exhibitor at many national group exhibitions including those at the Carnegie, the National Academy, and the Art Institute of Chicago. 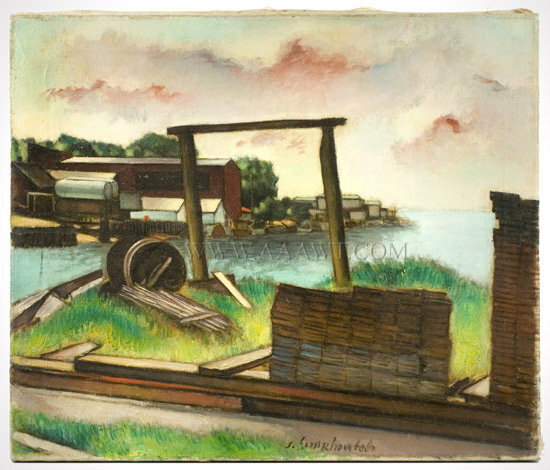 He also painted murals during the WPA and was commissioned to produce works at the federal Court Houses in Jackson, Mississippi and in Beaufort, NC. His paintings are in collections many museums including the Whitney Museum of American Art in New York City. 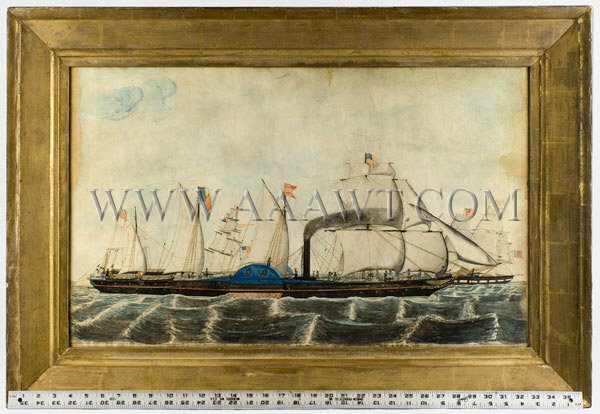 Two British merchantmen and a steamship flying an unusual assortment of flags are depicted entering and leaving American waters in this large watercolor. 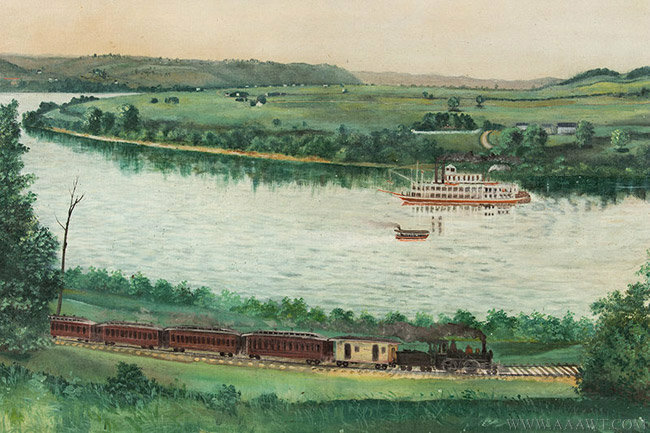 In a the foreground a side wheeler heads into port flying an American flag on the mainmast, a red swallow tail company pennant with "GW" in white, a Belgian national flag, and a British naval ensign on the stern. Just visible behind her is a pilot boat with a large "6" on its sails. In the background two merchantmen under full sail fly American flags at the stern as well as company pennants and the British Merchant Navy red ensign on their mainmasts. Seen on the steamship's deck are men wearing top hats and two ladies with parasols along with uniformed sailors on her decks. 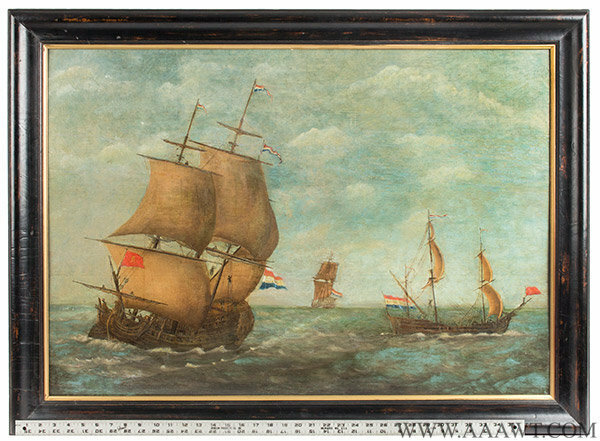 The painting is in a period 37 by 25" gilt frame. The view area is 17.75 by 29.5". The colors are quite strong though the painting has the usual toning. The edges have been professionally restored. A handwritten note on the backboard reads "L. Newman Paint[er]." 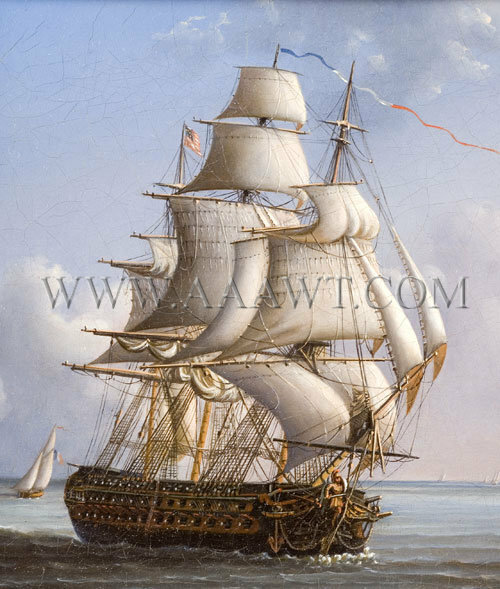 As depicted, beautiful palette; Man of War flying American colors. 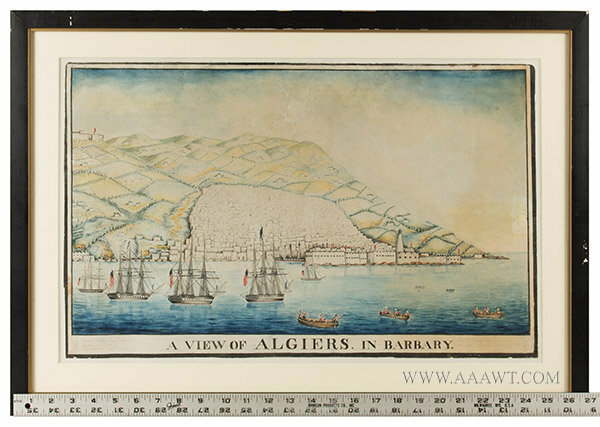 Dimensions: 14.25 by 12.25-inch frame, 10 by 8-inch sight-size. 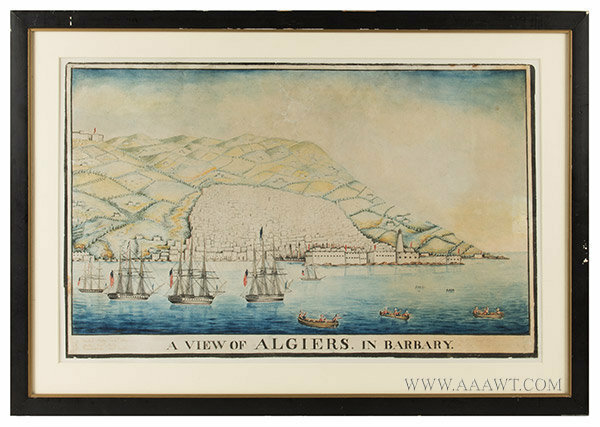 Signed and dated lower right, Aristide Chapuroy, Cette 1849, French, Active 1838-1849 Watercolor on paper; 16.5 x 25” sight size; in a period, gilded frame. 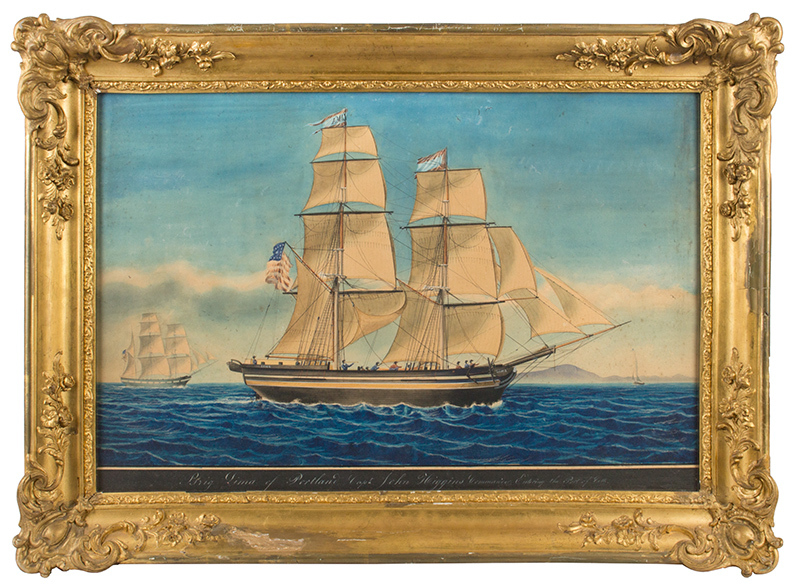 The LIMA, 261 tons, was built in 1829-1830 by George and Ivory Lord, G & I Lord of Kennebunk Landing, Maine, and was later owned by Winslow & Little of Portland. 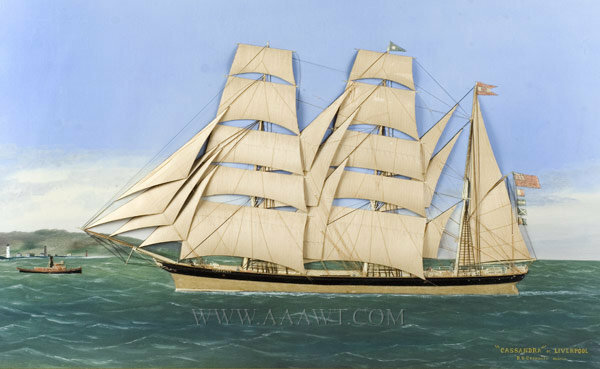 The LIMA was involved in the coastal, Caribbean and transatlantic trade. 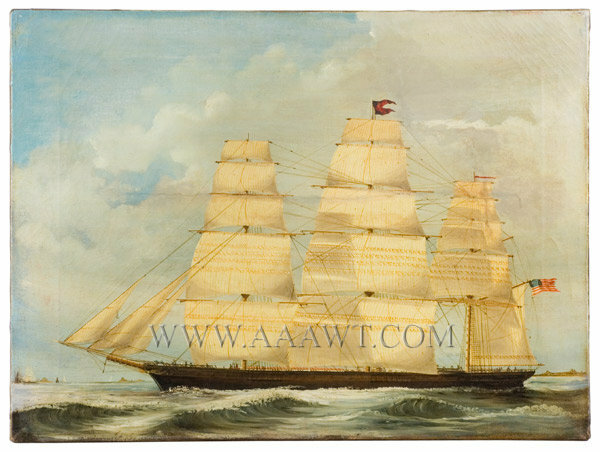 Reference: Chapurot painted a companion watercolor of the LIMA leaving the port of Cette, illustrated in Brewington, The Marine Paintings and Drawings in the Peabody Museum; page 31; no. 121. 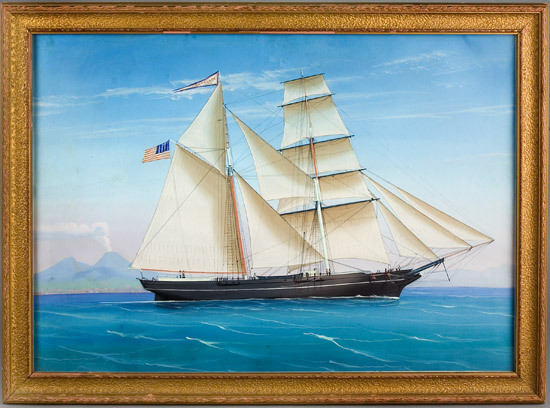 An American vessel from Salem, Massachusetts in the Bay of Naples. 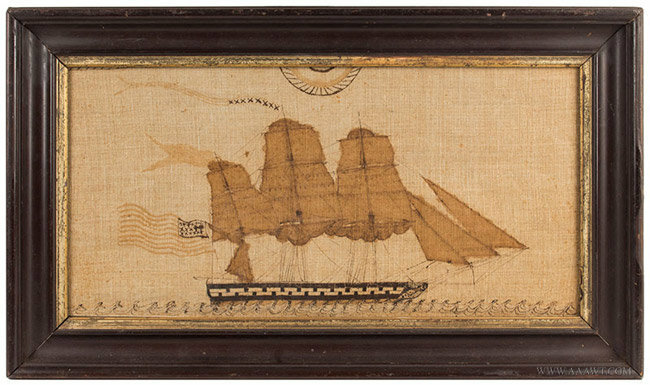 A very finely executed ship portrait with particular attention to sail and rigging detail, and figures of the Captain and his Lady on the afterdeck. 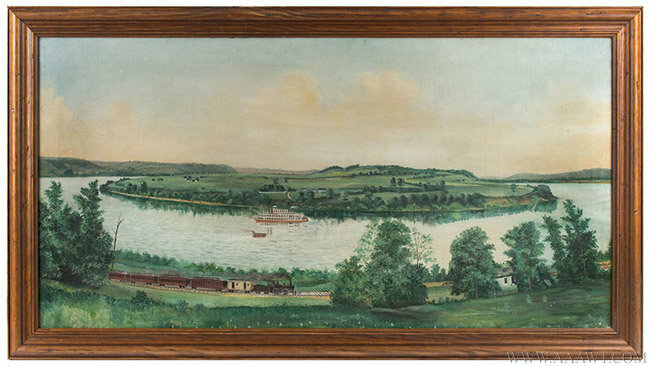 The work is contained in a pressed wood gilt frame having overall dimensions of 27 5/8 by 19.25”; 24 by 16” view area. 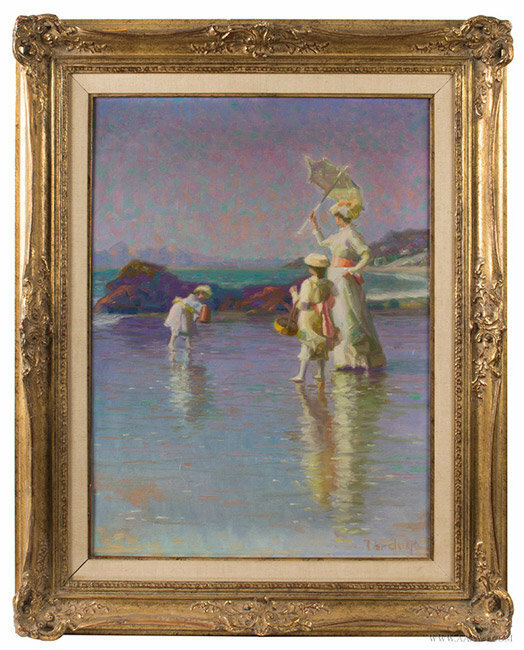 This bright painting is in good condition overall with two very small holes repaired in the sky, some minor scuffing and foxing. Ex Vose Galleries.